The Mayo News football podcast is back with a new series next week as we launch our club championship football show. Club championship football takes centre stage in the county over the next few weeks. After a very quiet July and August on the online airwaves, we have no doubt that the return of the club championship will be a welcome relief to supporters. The Mayo News football podcast crew will be back in full gusto with John and I hosting the show, while Mike Finnerty, Edwin McGreal and Ger Flanagan of the Mayo News will be out and about gathering stories from the various venues around the county. Each week we’ll have a featured game of the round and this weekend we’ll be attending the clash of Garrymore and Charlestown on Saturday. Ger and I will be there to bring you all the drama and atmosphere of this crucial group game between two sides in top form at the moment. That’s only the start of it, though, as we’ll also be reporting from the other grounds, bringing you post-game audio and most importantly sitting around the podcast table at Mayo News HQ once the weekend is done to assess the lay of the land in the Senior, Intermediate and Junior championships. There’ll also be updates where needed on all the big stories around Mayo football including the latest on the make up of the management team for the Mayo senior footballers and other news besides. That’s just the side dish, however, as for the next two months the Mayo News football podcast will be the talk of the parish as well as the county. The first episode of the Mayo News club football podcast 2018 will be online next Tuesday and will be available to listen to on iTunes and SoundCloud, as well as on the Mayo News website and here on the blog. It’s good to be back! This is great service lads especially for people away from the County or have emigrated from the country that would like to hear reports of how there clubs at home are performing in Championship and hear if any potential players are standing out in these games to get a call up by Stephen Rochford in 2019. Great stuff. Looking forward to it! Well done. Great service for those of us who cannot get to all the games. Brilliant stuff Willie Joe you have been missed. Looking forward to it already. I do feel you have missed a trick. Ah Ref would be an excellent addition to the team. Would he be interested? What he does and what the podcast aims to do should be complementary, Thequietman. We’re keen with the podcast to bring the same kind of focus that we’ve given to inter-county action to the club matches, making sure to focus on the club action in its own right and not simply view it as a talent-spotting exercise for possible future county players. The podcast has to date proved a big hit with supporters, based near and far, and we’re hoping that the club podcast will be of interest as well. Players to watch out for over the weekend who are currently not in mayo panel or development squad who have good potential. Padraig o Hora, Mikey Murray. Jack Reilly if back from USA. Well done wj. More good news. Billy Fitzpatrick from Garrymore would be another great addition to the podcast, has a great knowledge of Mayo club football, and he is very badly missed on Mid West radio Gaa commentary. I like to see you saying that the club championship is been covered on its own merits and not as a talent spotting exercise. As it should be. This is great news for anyone that wants to follow the club scene more closely this year and despite the odd hiccup we have in the county this is another good news story for Mayo this week. The very best of luck to all the team involved in this new venture . It’s great to be back talking about the club scene in Mayo and to be doing it when the fields are still dry and the possibility of the second cut of silage is still on. The clubs, for the first time in years, have had a chance to plan their preparations for the second round of the championship. Big teams laden with county players like Breaffy have had these players and have been able to work at training with them. Their encounter against Ballintubber will be one where a lot of eyes will be watching closely to see how its goes. If Breaffy have any serious intentions of doing anything in this championship they will have to be beating Ballintubber. The first game I polled was the Castlebar against Aghamore encounter. Some bookies giving odds of 1/16 on for this game. Looking through Paddy Power last night the Castlebar men were the only team that were away from home and were favourites in the country not just the county. This should be a comfortable win for the Mitchels as from what I have heard from a few in Ah Ref towers is that Aghamore were actually training with Tourlestrane as of lately. Maybe it was because of numbers or maybe it’s just a novel way of freshening things up. Such is the advantage of being close to the border you can do it. Either way the Mitchels wagon should roll on here without any major fuss. Unbeaten this year and have some of best scoring and defensive averages in the county along with a host of big names ready to do damage. Garrymore are heavy favourites on the polls and heavy favourites with the bookies but not here in Ah Ref HQ. This won’t be as easy as people think it will be in my opinion. Here’s a spicy one for you. Garrymore have played Charlestown 12 times in championship football. Garrymore have won 4 times and Charlestown have won 4. Four draws a piece so who is going to be lucky 13?. Aidan Higgins played in 95, prob the only ever-present player, Kevin Daignan also played in 95 but will unlikely play at the weekend. Some going from Higgins. A win for Garrymore will guarantee them senior football for their 50th year in a row next year (that’s fair clipping). I’ve seen both teams play this year and Charlestown impressed me. They are very comfortable on the ball and won’t shy away from the physical side of the game. Bookies are offering odds of 3/1 on this game and it wouldn’t be a bad outside bet. Both teams need to win this, simple as that. Knockmore priced at a juicy 1/4 and are way ahead in Ah Refs polls. Everyone says Knockmore. Home advantage another plus. Playing in Division 1 and comfortable in it. Moy Davitts division below and have had some poor performances as of late. Everything points towards a win for the men the North side of the bridge. Moy have the blonde bombshell Reape back from the “shtates” in time for the game and I can see them playing him at 11. Captain and GK Mcglynn may have a busy evening ahead. Knockmore will rely on the usuals; Langan , Diarmuid Walsh full back. Local Derby should suit players like Justin Rice who will thrive off the buzz.Trevor Howley is back training with Knockmore also but wont be involved I don’t think. Knockmore for me. Holly/Carra are a well seasoned team now compared to Westport. Having seen Westport play at the weekend vs Islandeady, one thing that really impressed me was Westport’s use of the short kickout. They used the Mayo vs Kerry semi final replay style of bunching up down the middle and hitting the runner from the pack. Very organised and gave them a great platform to attack. If that wasn’t on they still had the option of going long down the wings to players like McLoughlin. This worked a treat as with players with that pace, they were able to beat any form of blanket and carry the ball up to the scoring zone. With a half back line with Brian McDermott ,Kevin Keane at six and Lee Keegan they have a serious platform if they turn the ball over.One reservation I will have about seeing them is the loss of Shane Scott at midfield along with what seems to be the need for Westport forwards to be over thinking shots and worrying about shot selection. As Spillane said “paralysis by analysis”. Its in Westport and its a tight pitch which might suit Holly/Carra. Westport is a young team so you never know. The bookies and the polls all point to a Westport win but I don’t see there being much in it. Westport for me all the same. Claremorris clear favourites against a team who are looking for a win badly. Bad year for Crossmolina and are away from home. Claremorris came out of the traps this year at a great pace but they seem to have slowed down a bit since I saw them last. Ideal game to get going again and a win here will guarantee that they go through to the quarters. Not much to say really about this one. Claremorris should win and should win comfortably. Polls and bookies are well in favour of Claremorris and all here at Ah ref HQ. This is another one-sided poll for a couple of more obvious reasons in Mayo football. First of all the trip for the away team. One of the longest in mayo football and the destination doesn’t help either. Away to Kiltane is still one of the most talked about away days in football. Add to the fact that Davitts’ form has been abysmal this year and are propping up Division 2 it doesn’t look good for the away team. Colm Boyle made a return to the team last weekend and will be badly needed in Bangor. Haven’t seen Davitts this year but i have seen Kiltane. They are scoring goals for fun in the county and have the second most scored this year in Mayo football. Ultan Corrigan and Mikey Sweeney will be crucial and if they are on song its hard see anything other than a Kiltane win to be honest. I mentioned at the beginning of the preview that this game was probably the biggest of the weekend. The two West Mayo power houses go toe to toe again. This will attract the biggest crowd over the weekend more than likely. It’s always good when you have to park across the road in Clogher in the field. It means a large crowd in a small venue means a good atmosphere usually. Remembering back to the group game vs the Mitchel’s it was a great day out so I’ll be hoping for more of that. Cillian O’Connor sat out last weekends game but from what I have heard should be fit for the game. Plunkett and younger brother Diarmuid back, will mean Tubber will be back to full strength. SOS missing for Breaffy is a big loss around the middle but they have plenty to replace him. Interesting match ups all over the park and a local rivalry to enjoy. Spicy. I’ll go for Breaffy just because they have had a few weeks to get things together and have no excuse now. Breaffy also topping the polls heavily in this one but both teams are evens in the bookies. The deaf dog of the weekend because it’s so hard to call. Evens in the bookies and 46% each in the Ah ref polls. Couldn’t be closer to be honest and a game I am planning on attending. Ballagh have scored 42 goals this year in competitive football they have been flying. Having seen them play against Garrymore in a Walsh league semi, they impressed me and looked a well oiled machine. They have talent throughout the team and look well-balanced. Andy at 11 is nice to watch, looks like a different player. I noticed David Drake playing in the full back line in a few games so the plan must be to take up possibly Evan Regan. Hanley, Akram another two that should offer enough bite to get the most out of them. Consider Regan on the frees they don’t look a bad little set up even though Conway is a big loss. They are going well in Division 2 so they have every chance against the Nites. Ballina playing in Division 1 and are looking safe it seems. A win here and their season looks a lot different. Home advantage should count and should prove to be a cracking game. Ballina have some dangerous forwards so it should be a shootout on paper. A quick glance at the averages will show that Ballina are actually conceding very little on average throughout the year. Probably the toughest games of the weekend to call and I for one am looking forward to it. Enjoy the games will hopefully have time for intermediate games the next round…. The above is the article he wrote willie joe get him on board!! Ah ref has a ways to go to get rid of a rather childish, large, ugly chip on his shoulder. MayoMark – fully agree – he does great stuff in reporting club games but comes across as an incredible pleb with some of his stuff, which really takes away from the good work he does. Seems to have an issue with the Club 51 folks too for some reason. He has a steady bunch of followers, some of whom have their tongues firmly inserted up his rear so I doubt the chip will move or reduce in size while that goes on. Great to have the club championship back for the true grass roots football patrons. 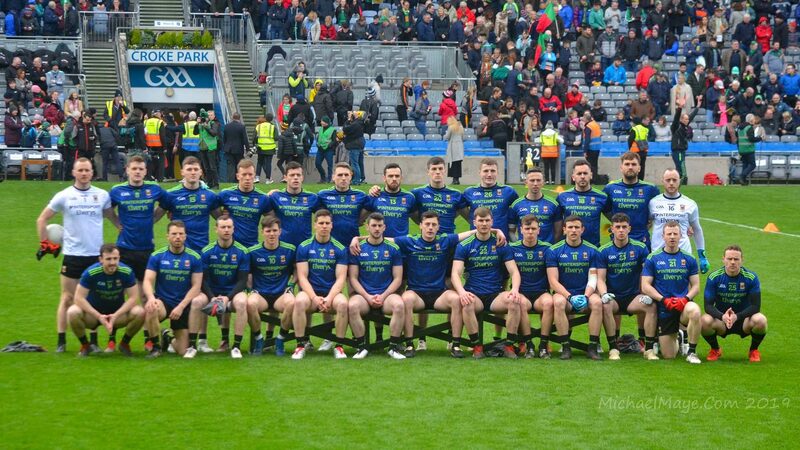 The often self professed “real supporters” who pop up every now and again in the spring and summertime with their expert views on Mayo football tend to stay quiet at this stage in the season. Wonder why? To all the Brian Reape critics who were critical of his American form he was man of the match v Knockmore today. Kicked some excellent scores and won a penalty to earn Moy Davitts a point against a highly fancied Knockmore team. Don’t think anyone was critical of Brian Reapes American form – just making the point that playing the Dubs in championship in Croke Park is a different world to playing in America during the summer. I am sure everyone hopes he gets his chance in league next year and proves he can perform at the top level. Consistent scoring forwards is one thing we are lacking – especially with Andy coming to the end of his career. Didn’t make the game today but a good win for the Mitchels. Seemed to be a day where a lot of young players were to the fore. Killian Kilkelly has stepped up unbelievable. @jp who and what age is this killian Kilkenny lad from holly mount never heard him before? Out of the country at minute but was catching up on news…super if mayo gaa actually appoint a commercial director but have they actually said this? I didn’t see any quote/reference from Connelly stating “Commercial DIRECTOR” or did i miss this? Without meaning to be negative but I hope it’s not a token effort and an in-house appointment. It needs to be done correctly and is years overdue. If it is then fair play and its a step in the right direction. Great news Rob and WJ and delighted to see that the focus will be on club games in their own right and not purely in relation to what they can do for the county game. Enjoyed that preview by Ah Ref as well, chip or no chip he knows his stuff. Had planned to get to Knockmore today for the Moy Davitts game until life intervened, but looking forward to Ballina Stephenites v Ballaghaderreen tomorrow, very tasty prospect. Great win for the Mayo U16 hurlers too bringing an All-Ireland (U16B) back from Ballyshannon today. And hard luck to our U16 camogie team, beaten in the AIF. I was at Ballintubber v Breaffy this evening. Enjoyable 2nd half after a fairly dull opening period. Diarmuid played midfield and was Tubber’s best player. Cillian and Aidan had decent games but not outstanding. Matty Ruane had a great 2nd half and scored 2 points. This is Willie Joe’s blog. There is nothing stopping him posting comments here is there ? Maybe he already does…………. Feeling a little underwhelmed too at selector announcement but what do I know! Attended the Garrymore game, and have to say Paddy Goldrick really impressed me again. He is only 18 and I believe his father may have played for Sligo. From the joys of Garrymore qualifying to the the despair of the Mayonews announcement tonight. We lose Buckley and McEntee and get a double act who have consistently failed to win a Moclair Cup with 5/6 of a county squad. Best of Luck to the two lads but leaking it to a newspaper before accepted by county board is a bad start for me. Best of luck to the two new selectors but not sure if it’s a good idea having two men so closely associated with one club being selectors. Maybe it would be a better idea to have 2 men from different sides of the county or different clubs at least but best wishes to them both and to Stephen. @Aidan. Killian Kilkelly is with Westport. He is U20 as he was minor in 2016. Pretty gutted tonight at the low level backroom. What a way to replace the best coach and a multiple All ireland winner. Expect mass retirements. This set-up is going nowhere – a great Mayo player who was not a successful intercounty manager 15 years ago, and a coach and a coach with no pedigree at top level. If the County Board approve this shambles they are endorsing a low budget low standard set-up that cannot challenge for an All Ireland. I hope there’s still a top coach going to be added to the ticket. otherwise that team looks distinctly average. Chiampionshio really kicking off. Westport lucky to win. Kilkelly is a big player. Was in on U20 panel this year? From what I hear Garrymore hadn’t it easy. Despite what looks like an easy win they were behind with 10 mins to go. with the selectors the big gap we have is in Dublin. It looks now if Stephen Poacher will be the man to look after the Dublin based players even though I’ve been critical of his tactics , maybe its what we need, low scoring games and certainly no big defeats with him as coach. P Forde at least in my humble opinion is a great addition, really don’t know anything about Conway. Read nothing about s poacher being involved? Went to the Westport game. Holly/Carra robbed..:penalty given to Westport which was clearly outside the box. Refering standards are a disgrace across da board. Mayo jersey signed by the pope. We’re a dead cert for the all ireland next year lads. Dave , burst out laughing when I saw it , and then nearly emotional when it pretty much sums up our love affair with the Gaa , regardless of whether we win an All Ireland or not . My ball, we’re nuts in this county. Its only the outsiders who realise it. It had to happen. There was no way he was coming to Charlestown without that jersey coming out. Killian Kilkelly of Westport, Darren Coen of Hollymount, Mikey Sweeney of Kiltane and Brian Reape of Moy davitts all having great scoring displays this weekend. Going to agree with Ger on this one. Underwhelming backroom team so far in my opinion. I really hope the coach will be a big name announcement. For the Dublin based players why not appoint a Dub? – Paul Clarke, Paul Curran etc. These guys know what it takes plus they are coaching at the highest club level in Dublin. Should also consider McEntee from Meath as Dublin based coach. Coaching talent does not exist in Mayo – must recruit from outside the county. Coen and Sweeney already tried at this level and neither impressed. For all the talk about Coen when he came up against a top class defender (Higgins in the Intermediate club final a few years ago) he was anonymous and missed simple frees. Can’t help but feel a little underwhelmed by the backroom team announcements, particularly with the strong Breaffy element. As mentioned above, a club that has had 5 reps on the senior county team plus Irwin and Hall, they always flatter to deceive. Seem to be more talk and glamour than titles and with Conway being heavily involved with them I wonder is he the top quality needed to bring us forward. Ford brings great experience both at club and county level. Plus, if anyone knows about playing the full back line its him. He delivered a senior club title to Ballintubber and will have the respecr of the players given his medals. Still, there were younger more successful coaches out there and I felt a Divilly or Flynn in the group would have brought a freshness. Did people really think that the financial costs of this years early exit wouldn’t have implications at some point? Delighted with His Holiness singing the Mayo jersey… Lovely touch… Now I know for a fact that he doesn’t go to the Mayo club match’s….But isn’t it great to have another fan, all the same .. We are an inclusive lot here in Mayo, and do our best to love our neighbours in Galway and Roscommon… Leitrim and Sligo too…and those who don’t go to club match’s every week.. Honestly. Like most posters am underwhelmed with this part of the backroom team.Hoping now that someone more inspiring will be added at the Dublin end. Also wondering what the reason is for the seemingly great haste in holding an Executive meeting on a Sunday evening less than 24 hours after the announcement, without the team being complete when a completed team was said to presented to Board to a meeting scheduled for Friday next Have never known of such a meeting being held on a Sunday before. A bit curious to say the least ? So I have already started looking forward to next year. Bring em on! @Outside of the Pale ….Strange and Bizarre really…. I’m not impressed! I I remember Bertie Ahern ran to the Phoenix Park in the middle of the night to call an general election… Or to avoid some award questions! What’s your source for the Stephen Poacher addition Norris? Would Shane Conway not be there in a coaching role? Surely he was doing that at/with Rice College? Can’t make my mind up on the selection panel. Cost cutting? Breaffy Mafia? On the other hand, Ford WAS good; I thought of Ford when there was some uncertainty about Rochy, so he is one of those who come to mind. Has he something to offer now? A wise head -I’ll buy that; ruthlessness – your comments are noted Myball and appreciated; ability to make right and timely calls on the line – hope he’ll be a help to Rochy there; experience – buckets of it. Conway? Know nothing, but for Rice College to even get to an A final was very impressive. If there is cost cutting involved, there may not be any more additions to the back room team. Technically only the goalkeeping coach has yet to be replaced and we probably don’t need one given the experience of the keepers. I’ve no problem with Ford and Conway as selectors. They both know the club scene as well as anyone which is important. Ford is well respected around the county and country. However, there needs to be an experienced coach brought on board now. I hope the county board won’t leave it at that. That polish dude who coached the Galway butler’s last season was very widely praised in Galway during last season, before they went on to win the final. Mayonaze – I think he was just an S&C coach. big gates at league. out of champ earlier=lower cost.